Ms. Nicole Basile is very happy to begin her third year at Divine Wisdom Catholic Academy. She feels very blessed to be given this opportunity. Ms. Basile will be teaching 5th grade ELA, Social Studies, and Religion. She can’t wait to get started on an amazing journey with the great students of the Academy. Ms. Basile graduated from SUNY Old Westbury College with a Bachelor’s of Science in Childhood and Special Education. She then proceeded to obtain her Masters of Science in Literacy from CUNY Queens College. Before joining DWCA, Nicole taught 4th grade in Bushwick, Brooklyn and was a permanent substitute in the Levittown School District in Nassau County. 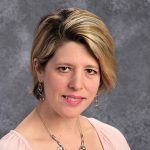 It is with these teaching experiences that Ms. Basile’s passion for teaching flourished. Ms. Basile knows that everyone has a talent and she takes great pleasure when students realize theirs along with the pride they take in themselves.